I took my first PMC class last Sunday and what you see here are my first pieces. I created a 'grunge type' nameplate for a pendant I'm going to embellish for my dear friend Irene. Using metal letter stamps and stamping directly into the clay. The back of this piece is also textured. Stamping the letters was a bit harder than I thought. You need to get the right amount of pressure. Small charm was created from a mold I had made earlier in the a.m. prior to attending class. I used a vintage button and created the mold using "mold n pour" by Suze Weinberg. Pressed in silver clay and popped it back out of mold. I then inserted a small garnet cabouchon into the center of the flower. Small silver owl pendant with bale. I created a mold using same technique from above this time using a vintage owl rubber stamp and baby powder for a release. One pair of earrings using plastic template for clay impression. I'm officially addicted and have purchased all but a small kiln to produce more pieces. 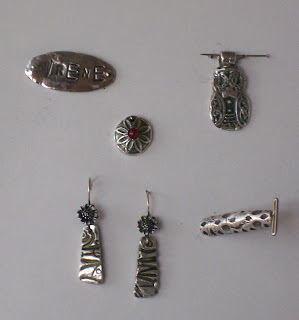 If you have any interest in working with silver jewelry this is the way to go. The pieces are all .999 fine silver when finished. All these pieces were dipped into liver of sulphur for some level of patina. Stay tuned... in the meantime be sure to stop by my other blogspot: "The Artful Eye"
ahhhhhh! Something I may need to try one day! They look great!